Yesterday Charles Whitehead and Anglican Bishop Sean Larkin spoke together on fostering spiritual ecumenism. Charles is a friend of Dorothy and Kevin Ranaghan’s and sends his warmest greetings to the People of Praise. “Your Protestant or Pentecostal friend who lives next door is your brother or sister in Christ,” Charles Whitehead, a Catholic, said. Fr. 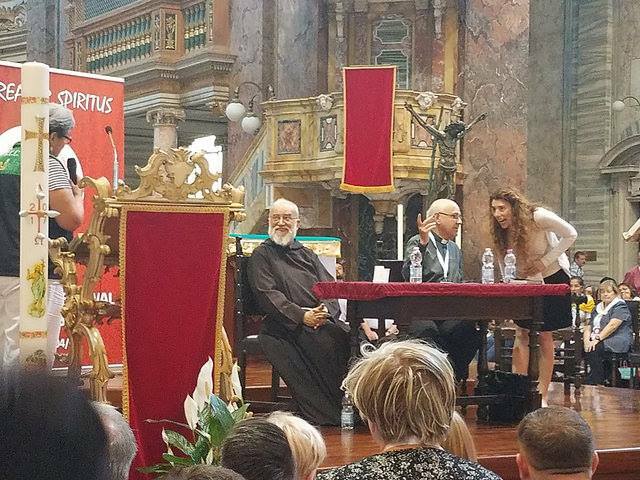 Raniero Cantalamessa, the preacher to the papal household, also spoke about ecumenism. He shared his own experience with first encountering the charismatic renewal, and said that the love necessary for unity came with his own experience of baptism in the Holy Spirit in 1977. “[Pope Francis] had a prophetic idea. He wanted to give this conference an ecumenical side because I am convinced he is moved by the spirit,” Fr. Cantalamessa also said. I’m so moved by all this talk of ecumenism. Some appear to be hearing it for the first time and are asking how they can explain ecumenism to their leaders and priests at home. They’re asking how they can possibly live with Christians of other denominations when there’s so much history of division. I’m in awe of the People of Praise and want to find some way to share the tools and experience we have with all of them."